Each month Birdzilla will profile a different famous birder, of the past - present - or future. Paul Konrad is a wildlife biologist who specializes in the study of birds with 30 years of professional experience as an ornithologist. He has conducted field research on cranes, hawks, owls, parrots, seabirds, grassland songbirds, shorebirds, ducks, and geese. 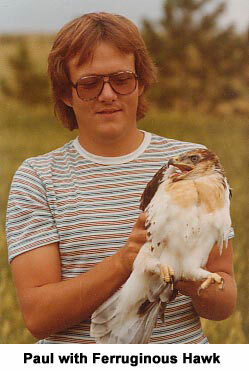 Konrad has been a birder all his life. He works to promote birding-based tourism and is a seasoned birding tour guide. His work in wildlife research and tourism has taken him to 44 countries and all 7 continents of the world. Paul is also a photographer, writer, and editor. He is the former editor of WildBird magazine, based in Los Angeles, where he published 96 issues during his 8-year tenure. Paul is one of the most published wildlife authors in America, with more than 400 popular articles published to date, along with more than 1,100 published photographs, 22 research publications, 1 book, and 6 web sites. Today, Paul resides in central North Dakota, the land of his ancestors, where he operates Wildlife Adventures, an umbrella business that includes a variety of professional endeavors ranging from writing and photography to field research on bird populations, tourism promotions including a series of Birding Drives, and production of education-based internet materials about birds for students, teachers, birders, and anyone interested in learning more about birds. Paul also serves on the Board of Advisors of the Central Grasslands Research Center.